Its been a while since I last posted. I wanted to concentrate more on the mechanics of the game. I added a new fight ability, a spin attack. Alpha-1 spreads its arms allowing Anna to spin and knockout enemies. On a side note, I will be at PAX Prime next weekend. If anyone wants to meet up PM me on Twitter or Facebook. This week I have been adding more destructible environments to Beyond the Infinite Abyss. Not exactly Micheal Bay style explosions. Also, I have been doing weekly dev video blogs for the game, check out my weekly #gamedev tests at http://facebook.com/bitcorestudios. To find out when the stream is up, be sure to follow/like our page on facebook. Here is a #ScreenshotSaturday of game progress for Beyond the Infinite Abyss. Here I am testing the explosions and physics from the grenades and fighting technique. This is in early alpha, game mechanics and visuals may change in the future versions. Hope you like it! Added new updates to the environment. Updated the camera handling for the cut-scenes to be more fluid. Also added a nifty helmet for her when she is exploring outside. Over the past couple of weeks I have been tidying up and prepping for the deployment of Mystic Mayhem on various systems. The first device I have chosen to deploy is the Ouya game system, The game is currently under review and hopefully be ready before Thanksgiving. What is an Ouya? An Ouya is a micro-console that runs Android OS. I was one of the original backers when they where on Kickstarter and thought it was a great idea to make Android games/apps available in the living room. The device makes a great Android dev tool and made it very easy to test using a controller and a touch interface, which is good if you want to deploy to other Android devices. 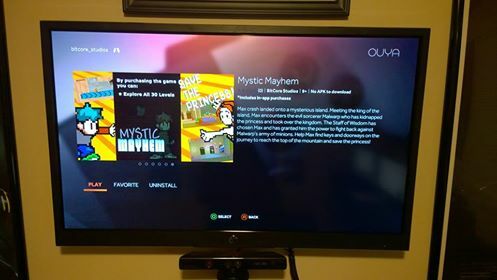 The Ouya edition of Mystic Mayhem will have the same levels, music, and gameplay as the Xbox version. It will also be available for the same price [ 99 cents]. Please keep checking this site because over the next couple weeks I will be submitting to Google Play, Kindle, iOS and others.